If you want to improve the overall quality of your images and try out new photographic techniques, then a decent tripod should be at the very top of your shopping list. Not only will it enable you to obtain sharper images, you’ll also be able to shoot in a wider range of conditions – such as when ambient light levels are too low to shoot handheld. In addition, you’ll also be able to keep your sensitivity settings much lower than would otherwise be possible, which will reduce image noise. Better still, a tripod will allow you to experiment with a range of creative techniques such as long-exposure photography, which can be used to capture movement in clouds and rivers. Of course, if you’re shooting outdoors in bright conditions, you may also need to employ a neutral-density filter as well as a tripod, in order to cut down the amount of light reaching the sensor so that you can open the shutter for longer. It’s not just landscapes that benefit from the use of a tripod, either – they are also extremely helpful when shooting portraits. This is especially true when you’re trying to shoot large groups of people, as a tripod will allow you to pre-frame the image and then concentrate on marshalling everyone into facing the right way and smiling for the camera – professional wedding photographers rely massively on their tripod when it comes to composing and shooting formals. of the shakiness commonly associated with amateur videos shot by hand. For these reasons and more, a tripod is one of the most important accessories in any photographer’s equipment bag. Over the next couple of pages, we’ll explore the different types of tripod and show you what to look out for so that you can make an informed decision and choose the tripod that’s right for you. As with all photographic equipment, tripods are available at a variety of price points and ultimately you get what you pay for. At the very bottom of the tripod hierarchy you’ll find plasticky, budget tripods such as the Velbon EX-530 (£35) and no-name or shop-branded tripods sourced from China. While these are just about ok for light and occasional use with compact cameras, they are generally quite flimsy and not built to last. Even when handled with care, tripods tend to take more than their fair share of knocks, so attempting to use one of these bargain-basement models on a regular basis with a heavier DSLR or larger CSC not only increases the chance of the tripod breaking, but can also put your camera at risk. Therefore they are best avoided. Spend a little more, though – say between £80 and £130 – and you’ll be able to secure something much more robust. At this price point, the market is awash with well-made yet competitively priced tripod systems such as the Vanguard VEO204AB (£99) and Slik Pro 340DX (£99). These benefit from much tougher construction, including stronger leg sections usually made of aluminium. Most tripods in this price range will be comfortably able to support a mid-range DSLR and consumer-grade 18-200mm travel zoom. Spending between £130 and £300 takes you into mid-range and enthusiast tripod territory, where you’ll find more fully-featured tripods that come with useful things like reversible centre columns, accessory hooks and 180° legs that fold back onto the centre column to reduce the tripod’s overall size for easier portability. At the higher end of this price range you will also find some carbon-fibre models that weigh considerably less than their aluminium counterparts, making them easier to carry around for longer periods. Many tripods in this price category are robust enough to support a larger enthusiast-level DSLR such as the Nikon D610 or Canon 70D with a pro-spec 70-200mm f/2.8 lens attached. It’s worth pointing out that many mid-range, most enthusiast and virtually all high-end tripods are sold as two separate parts: a set of tripod legs and a tripod head that sits on top of them. These two components can be mixed and matched to a degree, allowing you to create a combination that’s best suited to your needs. 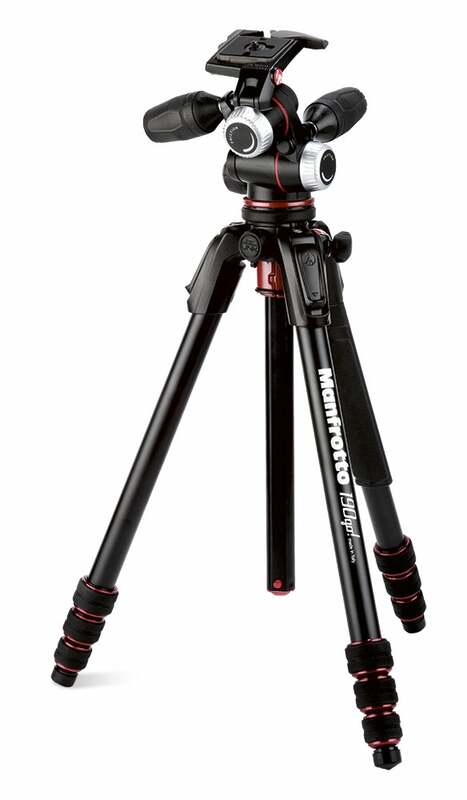 You don’t necessarily have to spend megabucks either – a decent two-part system such as the award-winning Manfrotto MK190XPRO3 tripod and Manfrotto 496RC2 ball head, for example, can be yours for as little as £150 if you shop around. Upwards of £300 and you’re getting into the realm of high-end and professional tripods. At this level you can expect the legs to be constructed from carbon fibre as opposed to aluminium, with liberal use of lightweight alloys used elsewhere in the tripod’s construction, alongside stronger (and often weather-sealed) leg-locks. High-end tripods will generally also offer a greater overall load capacity, along with an expanded feature set. Some tripods – we’re thinking specifically of the 3 Legged Thing Evolution 3 range, although there are others – even employ a modular design that allows you to re-configure how they are set up, as well as add bespoke accessories. While most leading tripod manufacturers cater to the high-end and professional market, Gitzo is generally regarded as the Ferrari equivalent of the tripod world – with price tags to match. 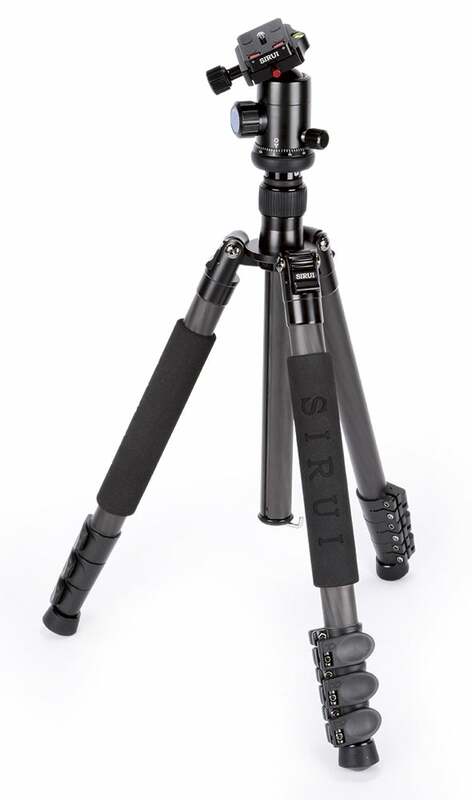 The Gitzo GT5562GTS Series 5 6X Systematic Tripod, for example, will set you back a cool £999 just for the legs. Combine this with a top-of-the-line Arca Swiss Monoball Z1g+ DP ball head and you won’t get much change from £1,500. Of course, you don’t need to spend anywhere near that much to secure something that will serve you well and last you a very long time, provided that you look after it properly. In our experience, anywhere between £100 and £250 is more than enough to secure most photographers a perfectly good tripod system. See our round up of the best tripods on the market right now. One of the most important things to consider when deciding what type of tripod is right for you is the weight of the camera equipment you intend to mount on it. This isn’t as difficult as it might sound, as most manufacturers helpfully specify a ‘maximum load capacity’ that refers to how much weight each individual tripod is designed to bear. To this end you might find it a useful exercise to attach the heaviest lens you own to your camera and weigh it, perhaps factoring in a bit extra if you think you are likely to upgrade your camera or lens equipment at some point during the tripod’s life cycle. This will give you a good starting point that you can use to narrow down your options. In addition to maximum load weight, two other important specifications to look out for are: ‘maximum extendable height’, and ‘minimum height’. The first refers to the overall height of the tripod when the legs and the centre column are fully extended, while the latter refers to the minimum height off the ground you can set it to. Of course, photography is a broad church, and different types of photographer will have different priorities. For this reason, many manufacturers offer specialist tripod ranges that are designed with a particular type of photographer in mind. 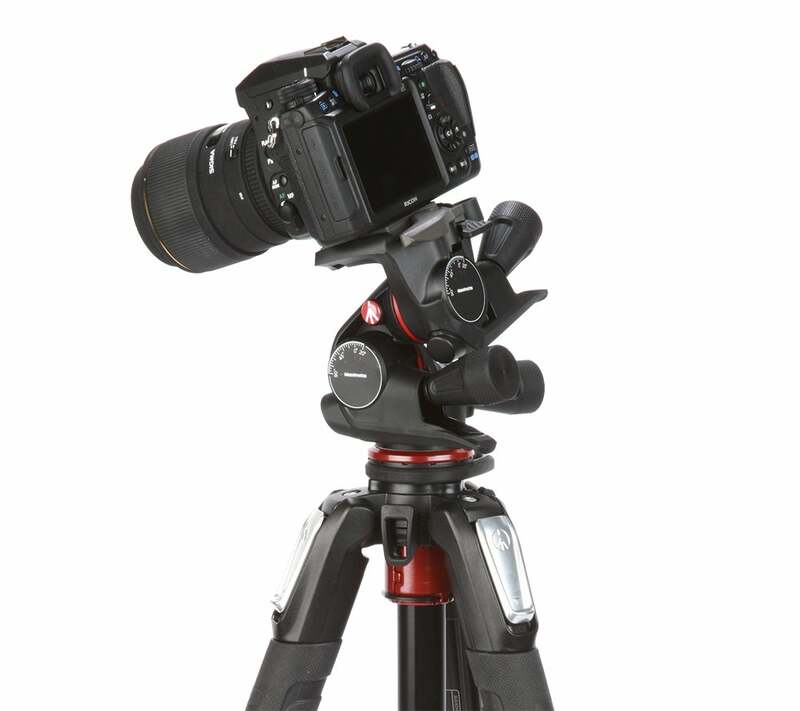 Travel tripods, such as those found in the Manfrotto BeFree and Velbon Ultra ranges, are especially popular at the moment as they offer a practical combination of low weight (typically around 1.5kg) and compact dimensions (typically around 40cm, although some are smaller) making them ideal for globe-trotting photographers and hiking enthusiasts alike. At the other end of the spectrum you’ll find larger, heavier tripods designed primarily for studio use, such as the 3 Legged Thing Evolution 3 Steve (£479). These are primarily concerned with providing a stable platform at extended heights for heavier professional-grade cameras and optics. The aforementioned Evolution 3 Steve, for example, extends to nearly 2m and can hold up to 30kg. If you don’t want to carry a large three-legged tripod around, but still want something to support your camera, then it might be worth considering a monopod. While monopods cannot hold a camera completely motionless, they do help you to keep it steadier than you would if shooting handheld. You obviously won’t be able to use one for long-exposure photography, though. 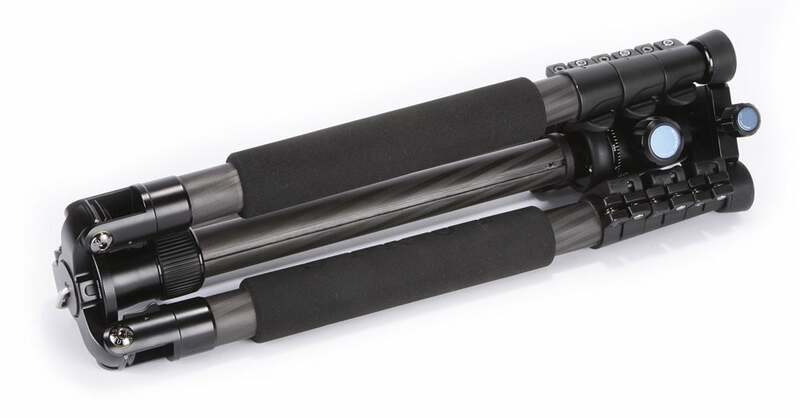 Given the free movement they offer, monopods are especially popular with sports and wildlife photographers. Buying a set of tripod legs is only half the story: you’ll also need a tripod head to sit on top of the legs and attach a camera to. These are available in a range of designs, each of which has its own strengths and weaknesses. One thing you need to bear in mind, however, is quick-release compatibility. Some manufacturers, such as Manfrotto and Gitzo, still use proprietary quick-release plates, whereas other manufacturers have adopted the more universal Arca-Swiss standard. Most professionals tend to prefer Arca-Swiss, as it’s generally considered to be a more secure and flexible mounting system. Ball heads use a ball and socket design that allows for quick adjustment in all directions. This makes them ideal when you need to frame your image in a hurry. Some also offer an independent panning axis that’s useful for creating ultra-wideangle landscape panoramas. The main downside to ball heads is that they can be a bit clumsy when it comes to fine-tuning your compositions. Hydrostatic ball heads alleviate this problem to a degree by adding independent resistance controls that allow you to fine-tune your composition without having to take the locking mechanism off. As you would expect, they do cost quite a bit more than regular ball heads, though. Basic pan and tilt (sometimes called ‘two-way’) heads allow you to control vertical and horizontal movement of the camera, usually with a single lever that can be locked off. While they can be useful for video capture, three-way heads are much more popular with still image photographers as they include an additional hinge that allows you to flip your camera onto its side so that you can shoot in landscape or portrait orientation – or indeed anywhere in between. 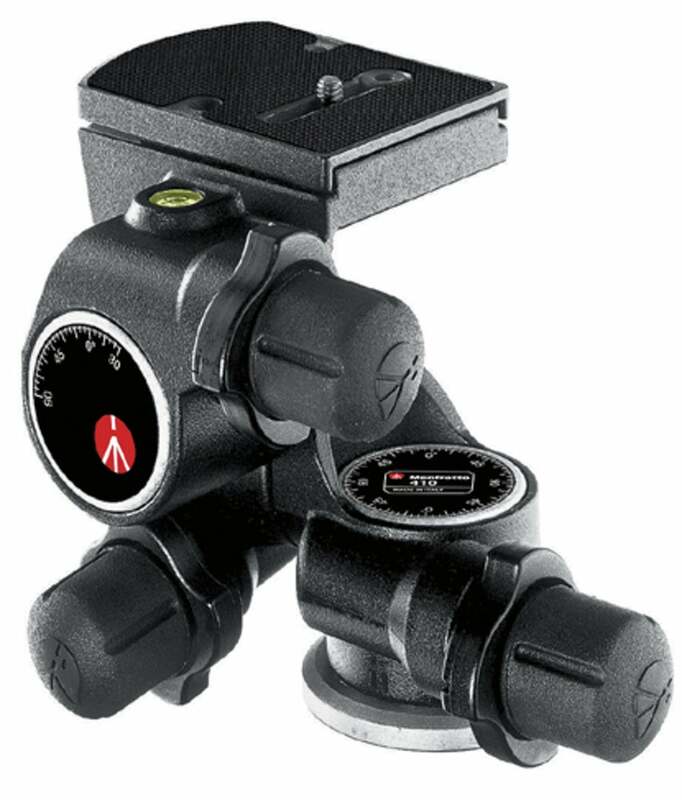 Other more specialist tripod heads include geared tripod heads that employ a set of geared dials (rather than lockable levers) to offer precise control over each axis. Given this they are best suited to a studio environment where precision is key. Last but not least gimbal heads are designed for use with large telephoto lenses. Unlike other tripod heads, the head attaches to a mounting point on the lens rather than the underside of the camera for increased balance. Gimbal heads offer fluid movement in all directions, which allows the photographer to easily track moving subjects. For this reason, they are especially popular with wildlife and sports photographers using long telephoto lenses. 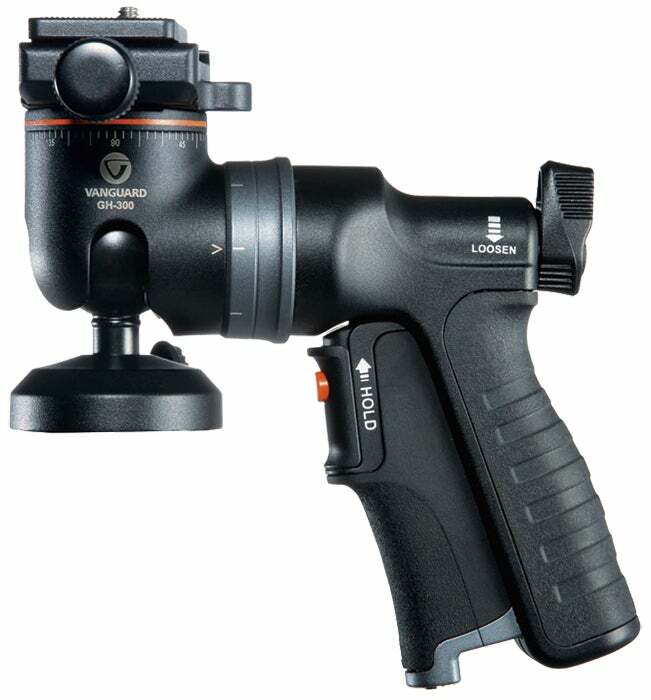 While three-way and ball heads are the most popular types of tripod head, pistol grip heads (also known as ‘joystick heads’) are gaining popularity. Built around a ball head design, they add an ergonomically shaped grip. This handle employs a sprung lever in the grip that allows you to take the locking mechanism off. The basic idea is that you don’t need to use two hands or mess around with locking levers – simply squeeze the grip and move your camera directly into place. While pistol grip heads offer excellent horizontal and forward tilt movement, they are a bit limited should you need to point your camera upwards – not ideal for bird photography or air shows then! The three telescopic legs that make up the base of a tripod are usually constructed from either aluminium alloy or carbon fibre. Aluminium is strong and stiff but also quite low in weight, while carbon fibre is lighter still. You will pay a premium for carbon fibre, though. section to be shorter, making the tripod slightly smaller and easier to carry when it’s closed. The tripod legs are attached to a crown at the top of the tripod, which the centre column slots into. Most decent tripods will give you a choice of two or three leg-angle settings, which allows you to open the legs wider in order to increase stability. The bottom of each leg is usually capped off with a rubber stopper, although some tripods also offer spikes which is useful in certain types of terrain. The leg locks connect each leg section together, allowing you to extend each leg to your desired length, then lock it in place. Lever-style locks and rotational (twist-action) locks are the two most popular locking mechanisms – choose whichever you feel comfortable with. Given the frequency with which they are opened and closed, leg locks are usually one of the first things to break on a tripod, so avoid tripods with flimsy, plasticky leg locks. The centre column slots into the middle of the tripod and allows you to extend its maximum height a bit further; though if you extend it too far it can make the tripod unstable. Many tripods allow you to reverse the direction of the centre column and shoot from ground level, with the camera upside down. Some, like Manfrotto’s 055XPRO3, also let you adjust the centre column so it protrudes to the side at 90° to the legs – useful for macro, for instance.